The latest revision of Google Android Market app is hitting handsets now, and while it doesn’t bring any new tabs for music, Android Police mentions a few changes you might find notable. 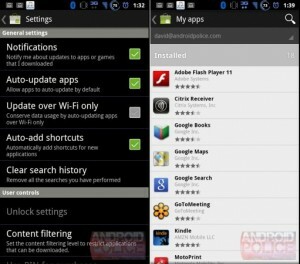 Among them are the ability to select auto updating for apps as the default option, as well as a setting to auto update only when connected via to the internet via WiFi. One change stolen from Honeycomb is a setting to automatically add homescreen shortcuts for new apps, while the UI has also been tweaked with a smaller font, new app drawer icon, and voice search button. As usual, it will probably automatically appear on your device eventually, but those who can’t wait can hit the source link and download the ripped APK of v3.1.11 right now. This application can use camera to enjoy.